Nigeria Football Federation president Amaju Pinnick sang the praises of the Super Eagles in the wake of their 1-1 draw with Uganda in an international friendly at the Stephen Keshi Stadium in Asaba on Tuesday evening. Pinnick pointed out that Uganda are one of the rising forces of African football, having narrowly failed to qualify for the 2018 World Cup. 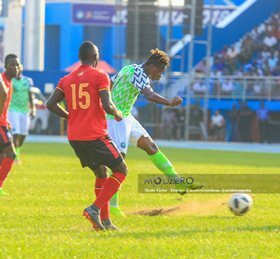 Nigeria manager Gernot Rohr handed home debuts to Villarreal's Samuel Chukwueze, Rotherham United's Semi Ajayi and Lokomotiv Moscow's Brian Idowu against the AFCON-bound Cranes while there was a full debut for Victor Osimhen. Speaking pitch-side minutes after the final whistle, Pinnick told Channels Television : ''They showed strength in the game, mental capacity, good football artistry, so we are very proud of what we saw yesterday. ''The last time Uganda came to Nigeria they defeated us, this is one of the strongest teams in Africa, I 'm telling you. ''This is a team that defeated Egypt, they were on the verge of qualifying for the 2018 World Cup, it's a reborn Cranes of Uganda. ''It's not a competitive game, we need to understand friendly games are meant to look at the strength and weakness of your players, especially the new players. The Super Eagles will return to action in March 2019 when they face Seychelles in a dead rubber Africa Cup of Nations qualifier.